Ok guys, let us admit that modern world sometimes looks like more girls-oriented with all fashion tips and ideas. But it is not a secret anymore that men need likes even more than women. Of course, it seems easy to publish your favourite look and gather shares and likes, if you are a film or a rock star. 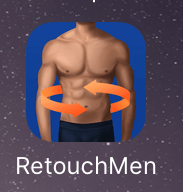 In case if you are an ordinary guy without any outstanding muscle or perfect smile, you will definitely need a help of professional retouch app for men, to create the ideal combination of your wishes and designer skills. Nowadays it is common to find thousand of programs and applications, which can help you to practice in Photoshop. Though, most tools are free of charge it does not mean that everyone should know which tone we must use retouching nose or abdominals. It is obvious that doing everything by yourself, you will probably create a good example of exaggerating. Luckily Apple Store offers more and more applications launched exclusively for men. It is so satisfying to know that also guys can choose and order individual trainings, calorie counters, online dating portals, etc. 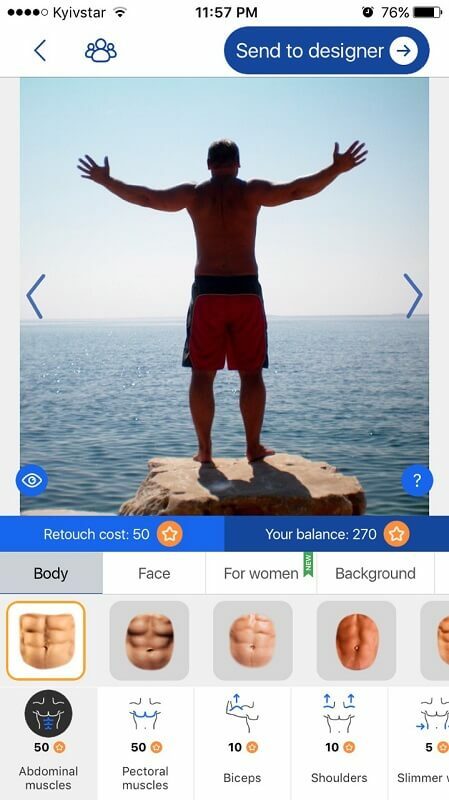 And even when the temptation to adjust your selfie is so strong to download free application, sometimes the certain cost has to be paid, guaranteeing the best result. If you want to make your life easier do not hesitate to pay an extra dollar to raise your self-esteem. 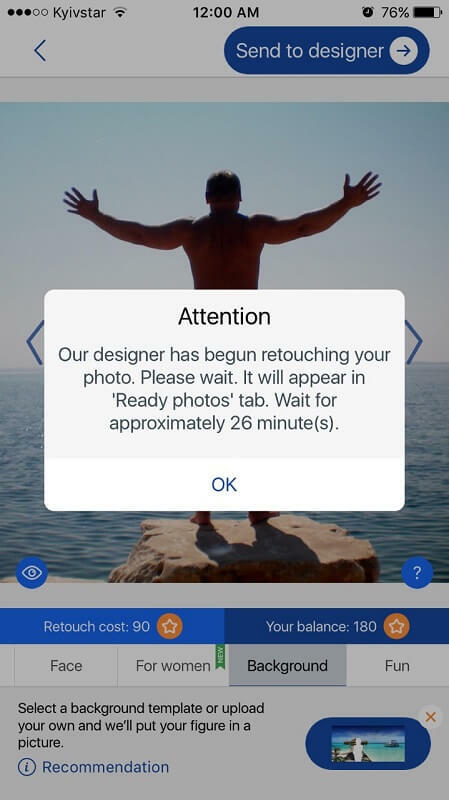 One of the latest arrivals for iPhone owners is RetouchMen, an application which joins designers and consumers in a fruitful easy communication, helping to get the best photo ever, making it stylish, memorable and professional. It is important to mention that it is quite simple and intuitive. RetouchMen does not require additional knowledge and skills in photo editing. Unlike similar applications online, using RetouchMen you do not need to deal with light correction, background adjustment or photoshopping. Everything you need is a picture to upload and a list of modifications to make. Everything else will be done by professional team of designers. So let us take a look at it closer and find out this nice and easy way to add a new touch to your look. Step 1. Download the application from the store and get the authorization. 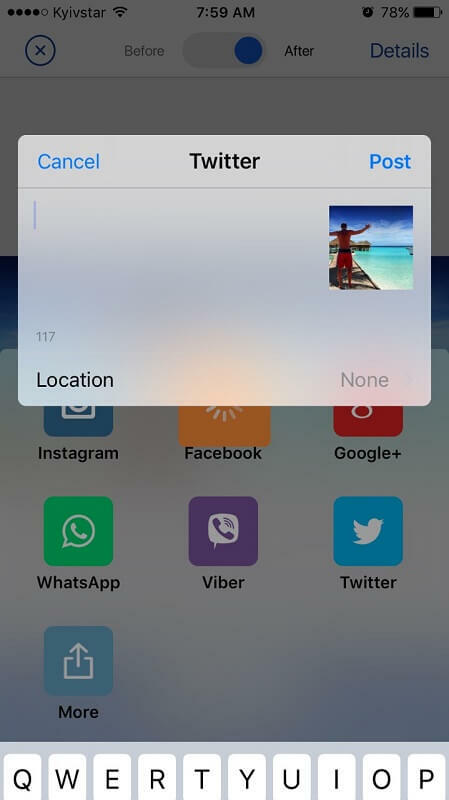 As soon as you see the application icon on your screen, it is ready to work. For authorization you need your email and password. If you want to choose another option, just try to use your social networks. In this case you will also facilitate the choice of images you have in your account. So you do not need to copy it, just choose the album and point the image. Step 2. Get your credits now. To start working and creating the perfect you, it is important to buy or earn credits. Such credits are necessary to pay the work of designers, which are going to retouch your photo. 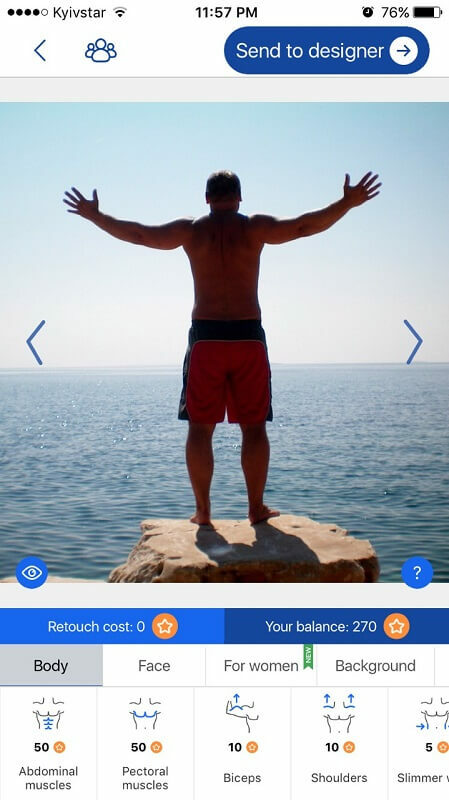 You are free to use credit cards or earn it with the help of Instagram and Facebook. You will be also surprised to know that some credits will be added after the first retouched work. Step 3. Choose the image you want to work with and go for it. 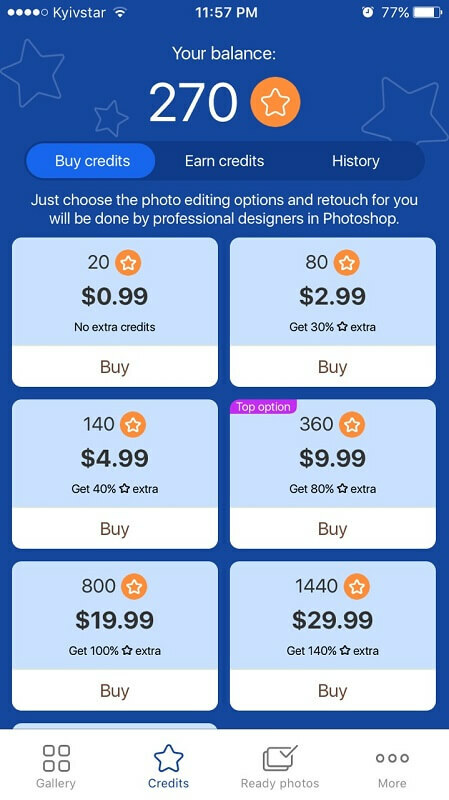 Any picture can be easily processed by a professional designer. You should only choose the one to be sent with your requests and wishes. There are no requirements the photo might have, that is why you will have absolutely no worries. Step 4. Decide what is going to be improved. Ok, you have got that photo, which makes you feel almost perfect, but there are always some imperfections. 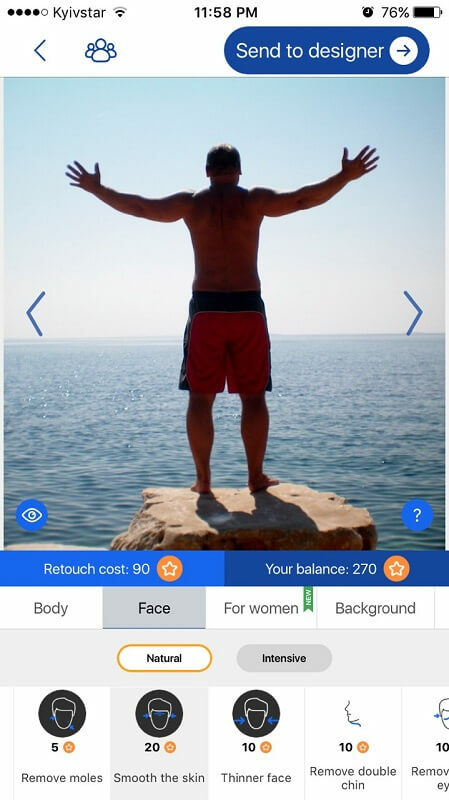 The app facilitates your work, because it offers a wide choice of points to retouch, so you may just choose one of them, like, face, body or background. This menu, located below the image, will give you a right tip to understand, what can be done. It is always useful to know that the picture might be with your friends or relatives. Just point out the person you want to improve and the work will be done fast and professional. For example, when you choose abdominal correction, there will be several options. It is comfortable to see the result you want and mention it in your request. The variety corrections, of course, has different prices. The application is so precise and simple that it offers immediately possibilities to correct wrinkles or eliminate second chin and skin irritation. That is really useful, because it is impossible to find a men satisfied with his smile or not dreaming of a magic beard corrector. It happened almost to all of us, when the perfect shot was done with some strange friends or toilet in the background. And it may seem that cutting the background is a good idea, but if you want to make it more realistic, then try to change it. There is no need to draw a precise body shape, which has to be left untouchable. Remember, there are real people, working on your image, so you will never get cut with a part of annoying details in the background. There is a number of possible landscapes which can improve the final result. Step 5. 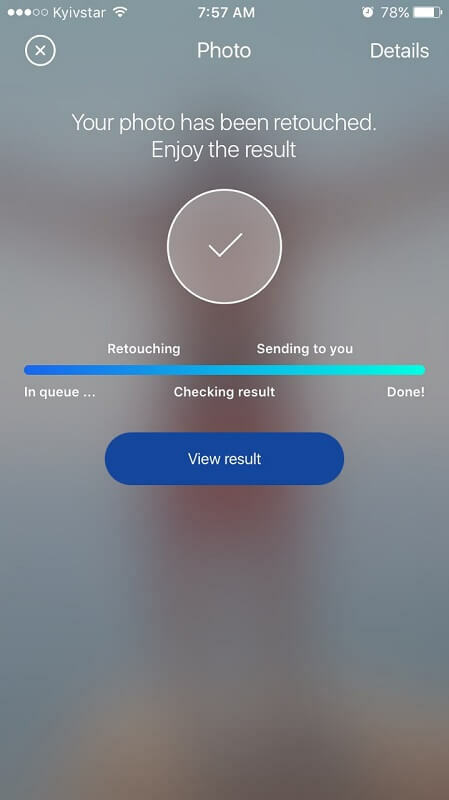 Forward your request and wait the result. Finally, having decided on all details and problems you may want to correct, the only thing to do is to send the request to the group of designers. Before that, you will be able to see the final price of the service requested, according to your wishes. So you will see a popup window, with general information on your application and your account balance. After that, you will almost immediately receive information on estimated time for processing of your photo. 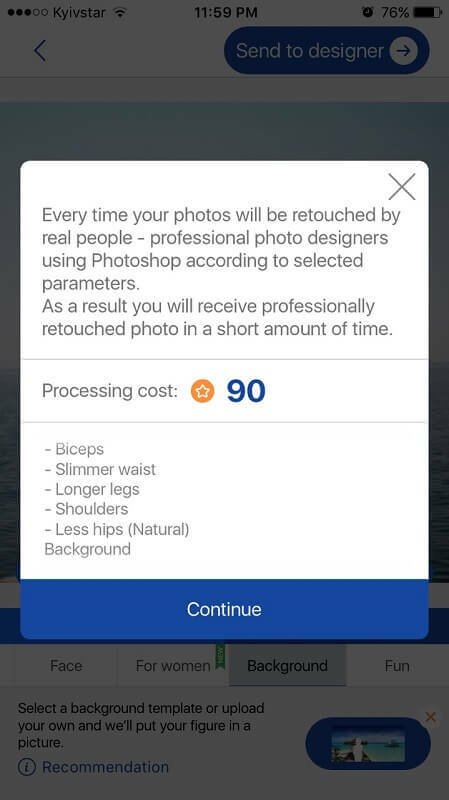 Obviously, not all of us have enough patience to wait results of body editor. That is why, application offers a comfortable possibility to control how much time left until the final result will be sent to its owner. Step 6. Getting the one you paid for. When it comes to getting your ready-made perfect photo, you will get not only a satisfying stunning look, but also a chance to compare retouch before and after. Sounds great, isn’t it? Such tool can help us evaluate effords of experts, who worked with you. You will notice the highly professional touch without being too contrasted or too retouched. 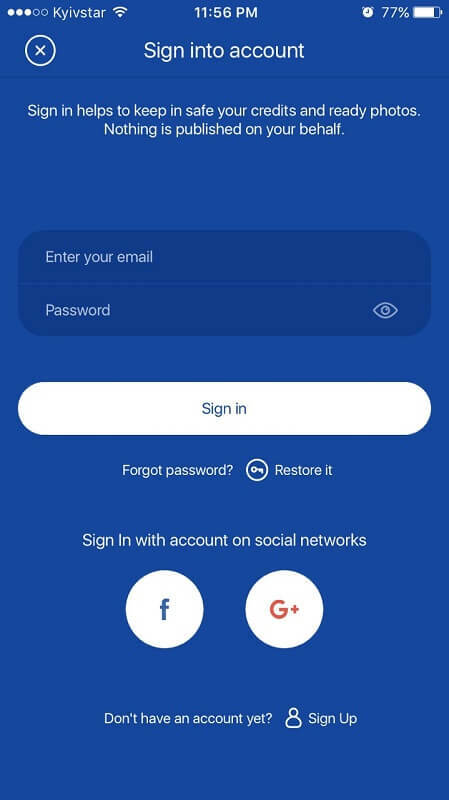 And, of course you will have a great chance to share the result in social networks, to save it in your phone or post it. This is how technologies can help us, becoming even more attractive, without getting stressed in a gym or at the seaside. Photo editor app for men with a good internet connection is the only tool to use. Try it by yourself and discover a new way enjoy your pictures.